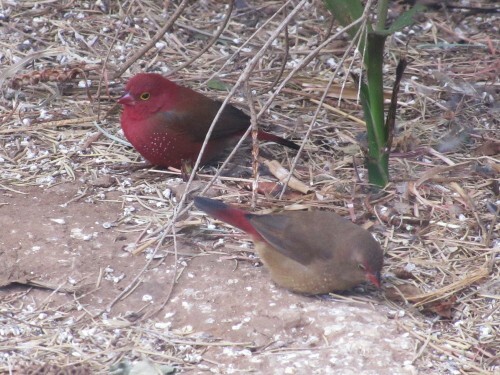 The beautiful Red-billed Fire Finch is found in southern Africa. The above photo was taken in our local zoo in Adelaide, South Australia. 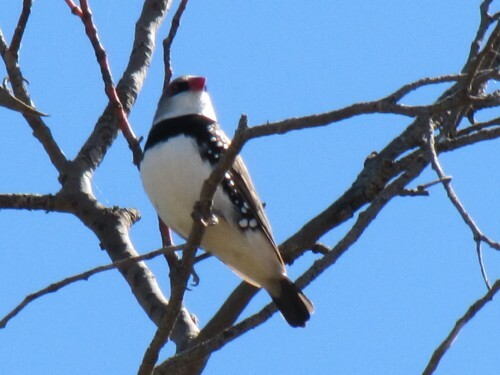 The first time I saw this species was in Addis Ababa, Ethiopia. You can read about that experience, and see the photos taken at the time by clicking here and here. There are many spectacular and beautiful birds in Africa. The weaver family of birds are among the more colourful and interesting of them. 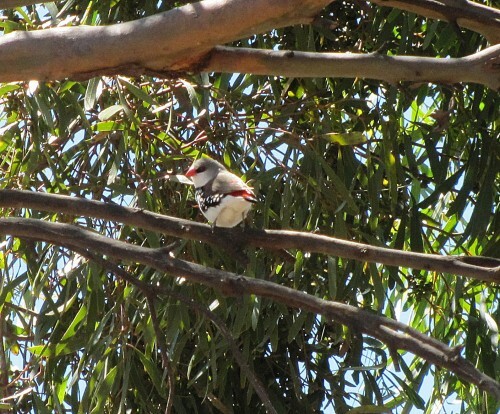 Adelaide Zoo in South Australia – my home zoo – has a small collection of Grenadier Weavers, as shown in today’s photos. The colourful male is a spectacular bird indeed, especially when in breeding plumage which ranges from bright orange through to red. 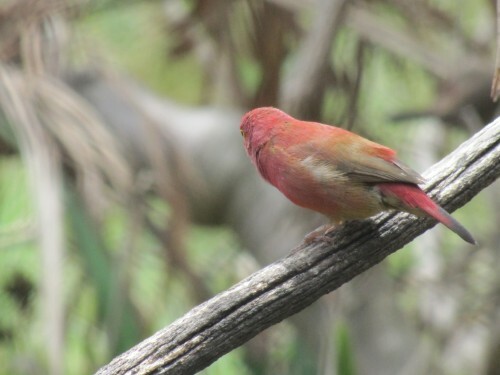 Of peculiar interest in relation to this species is a closely related species, the Red Bishopbird. This member of the finch family, also native to Africa, is a commonly kept aviary bird. In the 1920s some of these either escaped or were released from captivity not more than 20km from where I live. A small population survived along the banks of the River Murray for some years, and they were even featured in some earlier field guides. This small population has obviously died out as there have been no reports of any birds since the late 1950s. A few days ago I showed several photos of Red-billed Firefinches taken in the grounds of Bingham Academy in Addis Ababa (click here to view). I’ve just discovered another lovely photo that I took of this beautiful species, shown above. This species was quite common in the grounds of the school where my daughter was teaching last year so I managed a few good shots. I’m not sure about when they breed but this individual seemed intent on taking this feather with it. I can’t recall if I watched where it went. Another common bird I observed in Addis Ababa on my recent trip to Ethiopia was the Streaky Seedeater Serinus striolatus. This is another member of the finch family of birds. In the school grounds where my daughter was teaching they were very common, behaving like many species of finch and sparrow in cleaning up after the children had dropped crumbs and other bits of food in the playground. This species is found in the higher altitudes – from 1300 – 4500m – in Ethiopia, Kenya, Zaire, Sudan, Uganda, and Tanzania.